I love those bright colors you use, Pochadiva! A very poorly lit photo of ATCs heading off to DmyTLadybug. Those are incredible ladies Judy. So powerful. 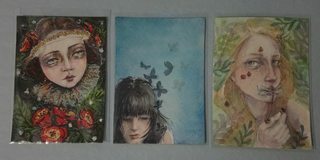 I finished my atc, do we post it here to show it off Or is it a surprise? We'd love to see your art here. But if you decide with your partner to mail as a surprise, then don't post here and mail first. After your partner sees it, then post. You can do it either way!! Wow Judy! Love those dazzling ladies! Amazing work everyone! I love seeing what you do. It's so humbling how everyone puts their all into art for partners. Nice! I received a gorgeous Zelda fanart card from Urocyonfox today!